Sometimes when clients come into the studio for their session, they decide to do multiple themes. Miss Emma decided to do just this. 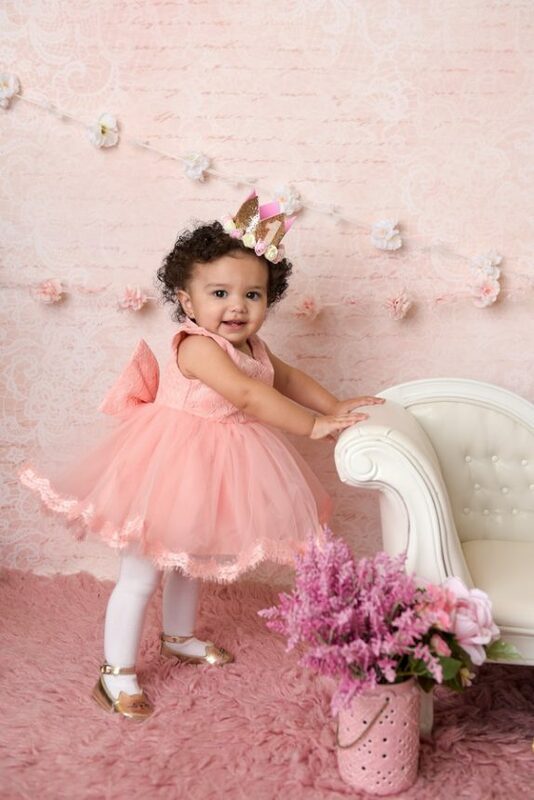 Her session spanned from unicorns to princesses, giving us a great variety of pictures for her and her family. 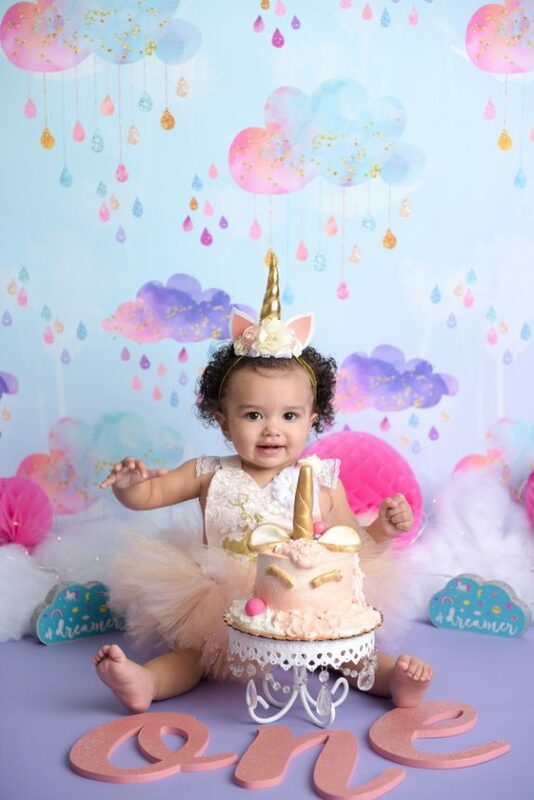 The unicorn cake smash was actually an idea that mom brought to the table. 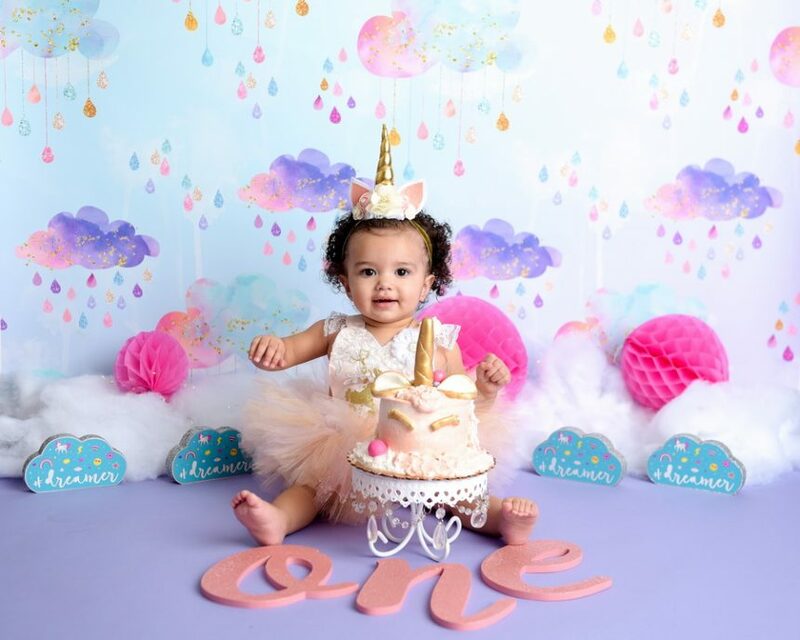 She saw a really adorable unicorn cake and knew immediately that this is what she wanted as a theme for Emma’s cake smash! When setting up our unicorn cake smash session, we used blue, pink, and purple primarily. These colors can be seen throughout the poofs, the decorative clouds, the flooring, and even the backdrop which also features colorful clouds. As an accent color, we decided to accent the cake with a hint of gold, giving the eyebrows and unicorn horn gold dust. The backdrop also featured golden rain dripping down from the water-colored clouds. To make the number stand out from the floor, we decided that a pink ONE sign would look great against the bright purple flooring. The coral color of the pink ONE sign nicely blended in with the clouds on the backdrop as well. Before our play-date with a yummy cake shaped like a unicorn, Emma decided to dress up and play princess. She wore a fluffy pink dress with a golden crown upon her head. The golden crown was sparkly and lined with pink and yellow roses. Emma’s dress was lined at the bottom with delicate pink lace and had a large bow on the back! The top of her dress was made of thicker lace, which also formed the bow. She chose to wear white tights with her dress and golden cat shoes as well. To decorated the set, we used a pink fur rug and placed a white couch to the right. A vase of pink flowers was set in front of the couch, and the backdrop featured a soft pink with words gently written across it. After our cake smash was a different story. Emma enjoyed her cake so much that she needed a bath! So, mom thought it would be cute to do a bath time photo session. 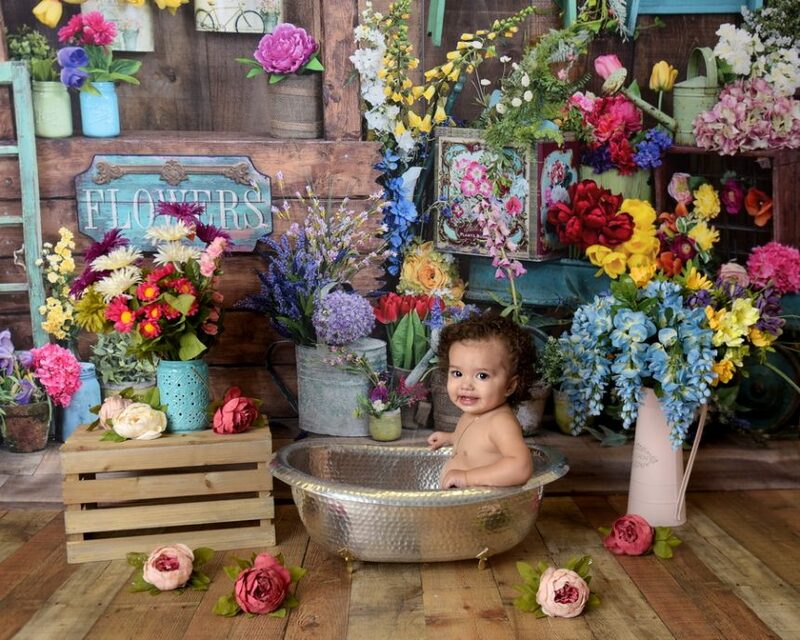 We used a variety of flowers for the backdrop and had a printed metal tub for Emma to sit inside. Kids are kids, right? You never know if they’re going to love taking pictures or if they may hate it. It’s really hard to know what you’re going to get. You may be wondering how we got this extensive session done with so many different scenes. It’s also convenient having a studio, especially when it’s snowing here in New York City, as this makes it easy to switch between themes. This entire session was very carefully planned, down to the hour we started. You see, it’s very very important that you set the session around the baby’s best time. If a session is during nap time for example, they will be more likely to cry and not want their pictures taken. When planning your session, keep in mind what times of the day your baby is most awake and lively! For help on planning your session, contact me here.